Facing a tough reelection fight in November, Sen. Kay Hagan, D-N.C., distanced herself from President Obama in her first debate against her Republican challenger on Wednesday, criticizing the president's policies on Syria, immigration, and the environment while proudly touting herself as the "most moderate senator in the nation." Her challenger, North Carolina House Speaker Thom Tillis, wasn't having it, portraying Hagan as a "rubber stamp" for the president and Democratic leaders in the Senate. During the debate moderated by "CBS This Morning" anchor Norah O'Donnell, Tillis attacked her record on Obamacare, on veterans health care, and other issues, saying she's been an ineffective voice for North Carolinians in Congress. "Kay promised us she'd be different, but she broke her promise," Tillis said, citing a figure that found she voted with her party 95 percent of the time. The race in North Carolina is among the most competitive Senate elections this year. 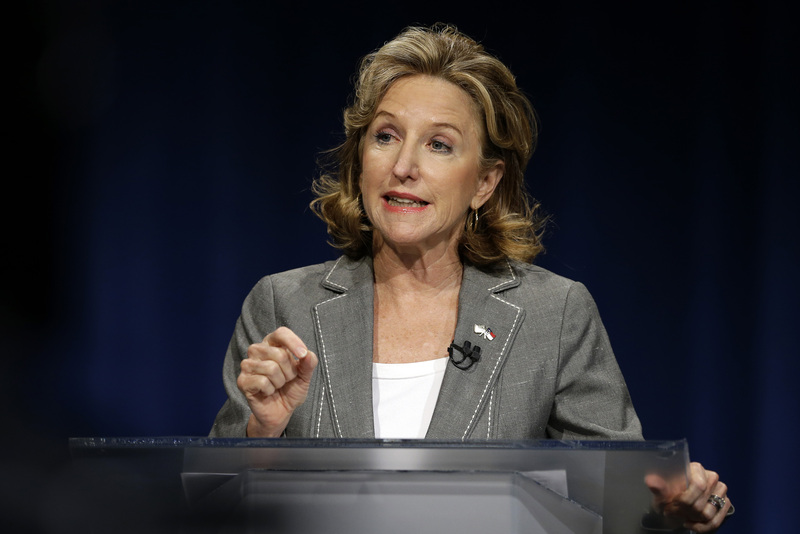 A USA Today/Suffolk University poll released last month showed Hagan in a dead heat with Tillis: up 45 to 43 percent, within the poll's margin of error. Other recent public surveys have shown the Republican in the lead, reflecting a statistical dead heat. The result could well determine which party controls the Senate in the next Congress. Republicans need a net gain of six seats to seize the majority, and they've elevated Hagan as one of their top targets, hoping to capitalize on Mr. Obama's relative unpopularity in North Carolina. Tillis, the speaker of the North Carolina House of Representatives, linked Hagan with the president again and again. He noted she cast the "deciding vote" for Obamacare, and he criticized Hagan for echoing the president's now-debunked assurance that people who liked their current health care plans could keep them under the new law. Hagan warned that Tillis would elect to take Americans back to a "broken system" in which insurance companies could deny coverage and seniors would pay more for prescription drugs. She noted her proposal to grandfather existing health care plans into Obamacare to alleviate the crisis spurred by the rash of plan cancellations under the law. And she criticized Tillis for supporting a GOP-authored budget that would convert Medicare into a system that would provide vouchers to seniors to buy insurance on the private market. On immigration, Tillis knocked the "bipartisan failure" to secure the border, and he criticized the president for considering executive actions to slow deportations. On that count, Hagan agreed, saying the president "should not take" action to ease deportations. But she also defended her vote in favor of the comprehensive immigration bill that passed the Senate last June, noting its variety of Republican co-sponsors and saying it would throw considerably more resources at border security. "Inaction is not an option," she said. "Speaker Tillis has no plan to solve our immigration system." Hagan also distanced herself from Mr. Obama on U.S. policy in Iraq and Syria, saying the U.S. should have moved more quickly to arm the moderate Syrian rebels. The failure to do that, she said, allowed extremists to grow and gain power in the region. Tillis, for his part, demonstrated a surprising fluency on foreign policy matters for a state lawmaker, discussing the roots of the militants fighting in Iraq and Syria and criticizing the president for failing to develop a strategy to combat them. "Kay Hagan has allowed it to happen," he added. And on the reform of the beleaguered Veterans Affairs health care system, a crucial issue in a state with as sizable a military population as North Carolina's, Tillis criticized Hagan for being asleep at the switch. "For five and a half years, Kay Hagan's been in Washington. I haven't heard her pounding the table with Barack Obama," he argued, saying she knew the VA system was broken in 2008 but she "failed to fix it." The incumbent used the opportunity to again distance herself from the president, saying she'd "demanded better" from the administration on veterans' health care. She welcomed the recent passage of a bill that would devote more resources to the VA system and allow veterans waiting for care to go to a private health care provider. Hagan spoke in a clipped tone for much of the debate, hesitating over word choice and rarely finding her comfort zone. She did come alive, though, discussing women's issues, saying she would "never back down" when it came to the health and well-being of North Carolina's women. She criticized Tillis' record on women's issues as "abysmal," saying his positions on contraception, equal pay, and other issues demonstrate he is "out of touch with women." On April 20, 1999, two gunmen killed 12 students and one teacher at Columbine High School in Littleton, Colorado. Nearly 20 years later, we asked members of the Columbine community – Amy Over, Kacey Johnson, and Tom Mauser, father of Daniel – to write letters to their younger selves and reflect on the two decades since the shooting.